Christophe Rousset’s recordings for Aparte have been resurrecting jewels of the French High Baroque for years now. In the series I’ve heard his Phaéton, and also Rameau’s Zaïs, and both are excellent. Rousset, who is an expert in the music of this period, lavishes care on the scores, assembling expert soloists to sing alongside Les Talens Lyrique, his crack team of instrumentalists, and they’re beautifully presented too, in hardback books with accessible essays and full texts and translations. 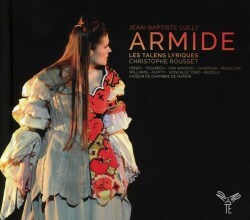 This Armide, a seminal opera for Lully, is every bit as fine, and is perhaps my favourite of the ones I've heard so far. Tasso’s 1581 story of Armida is one of the most adapted of all the tales that have been turned into operas. It has inspired operas from, amongst others, Handel, Gluck, Haydn and Rossini, with its story of the conflict of love and duty, together with liberal helpings of sorcery and magical stage effects. Lully’s 1686 setting probably has a fair claim to being the earliest and, coming as it did at a difficult time in the composer’s life, it was an important part of his rehabilitation into the musical life of the court of Louis XIV. As with Phaéton, the first thing that strikes you in this set - and perhaps the best thing about it - is the crisp cleanness of the orchestral sound. Rousset is, of course, a whizz with this sort of repertoire, and he has the finest feeling for this whole lost musical world: lost, but here brought back to life convincingly. There is tremendous class and élan throughout, but he is also fantastically nimble during the magical scenes in Act 4 so we don’t just get Gallic insouciance. The divertissements in particular, such an important part of the French Baroque, sound magnificently alive, and Rousset brilliantly recaptures the feel of the French court as though it were all in a day’s work; indeed, with something of the nonchalance of which Louis XIV’s court would have approved. The cast of singers he has assembled is formidable, and worthy of the challenge. In particular, Marie-Adeline Henry in the title role has a magnificent sit-up-and-take-notice quality to her voice. It's a forthright mezzo-ish soprano that has an element of declamation to it, making her absolutely perfect for the role. Her dream narration in Act 1 is fantastic, and she runs through a spectacular range of emotions during her great monologue that ends Act 2. Her final aria of desolation that ends the opera is extraordinary, but so is her whole performance, perhaps the most arresting piece of singing I've heard on disc this year so far. Every bit as fine, though very different, is Antonio Figueroa, who is the sort of haute-contre ténor who you thought just didn't exist anymore. He hits the stratospheric heights of the role with seeming ease, and there is an overriding sensuality to his tone that I found really quite seductive and utterly beguiling, nowhere more so than in his address to the natural surroundings of the grove in Act 2. Singers like him make the rediscovery of such roles a real joy, and the disc is worth picking up just to hear what he does. It's extraordinary to think that they used to be expected in Lully’s day! As Glory in the Prologue, Judith van Wanroji sounds bright and lovely, and is partnered well with the more fruity Wisdom of Marie-Claude Chappuis. Both also transfer these same qualities to their critical choric roles as Armide’s companions, and are particularly cherishable during the victory hymn of Act 1. Douglas Williams makes a rich, saucy Hidraot and subsumes his Anglophone background into convincing French. Marc Mauillon uses his very different tenor to great effect as Aronte and, even more memorably, as Hate, who Armide conjures up to purge her heart of love for Renaud. Cyril Autivy and Etienne Bazola do most of the work in Act 4, and they do it very well, as does Emiliano Gonzalez Toro in his brief appearance as Artémidore. The chorus, too, sound marvellous throughout and, without wishing to state the obvious, one of their greatest assets is that they just sound so French! They also sound consistently vigorous and alive to all the subtleties of the musical line, while at the same time appreciating that they are part of a bigger texture. It's easy to forget that the whole thing was recorded live, so effective (and suggestive of studio-bound perfection) are the recording’s conditions. The audience are extremely well behaved throughout and there isn't a hint of extraneous noise. This, therefore, makes another feather in Rousset’s cap, but also a very welcome addition to our musical knowledge. The more I hear of Lully, the more convinced I am that he should be more widely known, so let’s hope this recording furthers that aspiration.